Silver-tone stainless steel case with a brown leather strap. Fixed silver-tone stainless steel bezel. White dial with luminous black hands and index hour markers. Minute markers around the outer rim. Dial Type: Analog. Luminescent hands and markers. Date display at the 3 o'clock position. Chronograph - sub-dials displaying: three - 60 second, 30 minute and 24 hour. Orient Calibre KFD00 quartz movement. Scratch resistant mineral crystal. Pull / push crown. Solid case back. Round case shape, case size: 41 mm, case thickness: 10.3 mm. Band width: 21 mm. Tang clasp. Water resistant at 50 meters / 165 feet. Functions: chronograph, date, hour, minute, second. Casual watch style. Watch label: Japan Movt. 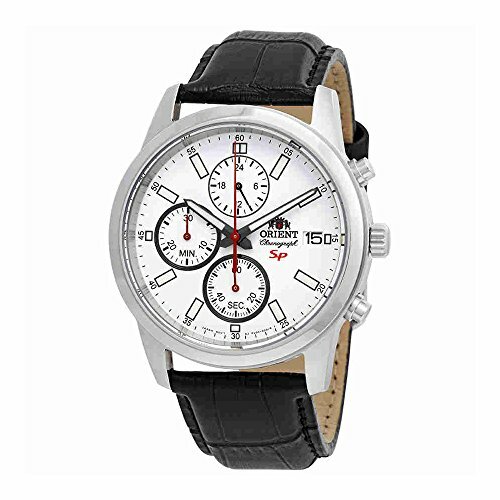 Orient SP Chronograph White Dial Mens Watch FKU00006W. If you have any questions about this product by Orient, contact us by completing and submitting the form below. If you are looking for a specif part number, please include it with your message.